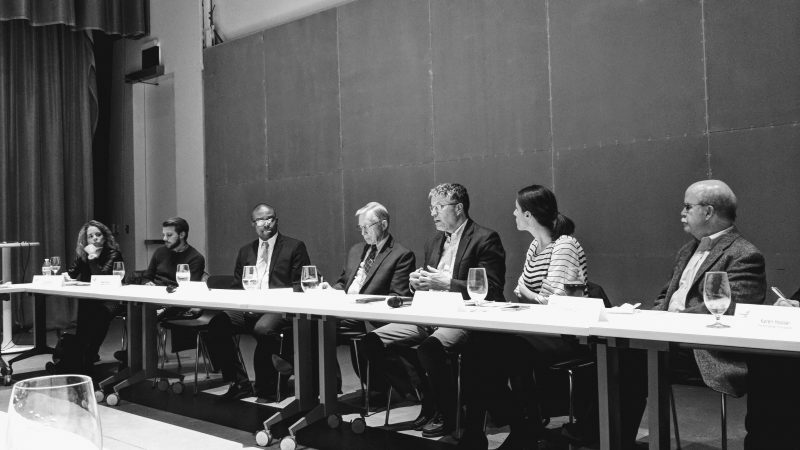 Grantmaking organizations and community partners sat down this week at the Museum of Contemporary Art Cleveland (MOCA) to discuss the ongoing success of Housing First and reflect on the benefits of collaboration. 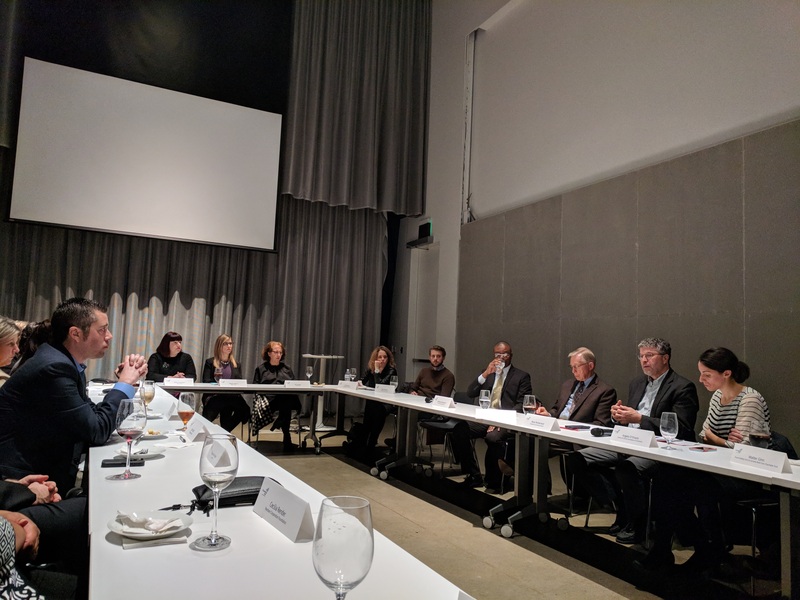 The event, a roundtable conversation convened by Philanthropy Ohio and sponsored by The Nord Family Foundation, included representatives from Dominion Energy, Bank of America, Cuyahoga Arts & Culture and MOCA, among others. Leading the discussion were several partners of Housing First, including Sisters of Charity Foundation of Cleveland, Enterprise Community Partners, EDEN Inc. and CHN Housing Partners. The group welcomed guest speaker Lloyd Pendleton, director of Utah’s homeless task force, who instituted a 10-year Housing First-modeled plan in Utah that has seen a 91 percent reduction in chronic homelessness across the state. MOCA hosted the discussion with the intention of continuing to bridge the gap between arts organizations and grantmakers. Following the event, participants had the chance to explore an exhibit by British artist Phil Collins titled “my heart’s in my hand, and my hand is pierced, and my hand’s in the bag, and the bag is shut, and my heart is caught.” The work features six listening booths in which attendees can listen to audio arrangements developed from recordings of telephone calls from a homeless shelter in Cologne, Germany. The Housing First initiative in Cuyahoga County formed in 2002 in response to the hundreds of individuals with disabilities who were living on the streets or in shelters for more than a year. To address this crisis, Sisters of Charity Foundation of Cleveland (SOCF), in partnership with Enterprise Community Partners and the Cleveland/Cuyahoga County Office of Homeless Services, brought the evidence-based, national model of permanent supportive housing to Cleveland. This model links decent, safe, affordable housing with on-site flexible, voluntary support services designed to help an individual stay housed and live a more productive life in the community. Angela D’Orazio, program officer at the Sisters of Charity Foundation of Cleveland, spoke about the unique opportunity that the Housing First initiative creates for a grantmaking organization. Mark McDermott, vice president and Ohio market leader for Enterprise Community Partners, added that the development of trust is essential in the collective impact model. Housing First serves individuals with disabilities who have been homeless for at least one year, or at least four episodes totaling 12 months of homelessness in the past three years. The initiative has reduced long-term homelessness in Cuyahoga County by 86 percent during the past 10 years and is on pace to end long-term homelessness in the county by 2020. Pendleton, who spent two days touring Housing First locations and talking with the team, said that Cuyahoga County’s model is “one of the most successful, especially in terms of collaboration” that he’s seen across the country. Understanding best practices from other organizations and individuals like Pendleton has allowed Housing First to be successful, D’Orazio said.